Hello World! The SUN is out and we're feeling a bit more festive than usual at Wynola Farms M arketplace. Trez has re-opened the Country Cellars Wine & Beer Tasting room here at Wynola Farms and is serving tastings from local San Diego County brewers and vintners. Her new digs are located at the East end of the Marketplace in the old 1920's gas station. Look for her new colorful signs. 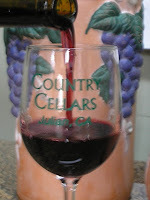 As always, Julian Hard Cider and Orfila Winery will also be serving tastings of their own brilliant creations. This week's Farmers' Market lineup is looking good. 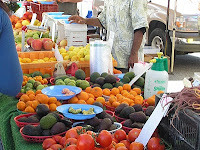 We'll have fresh picked fruits and vegetables from our 3 main farmers. In addition, we'll have nuts from La Spice, Sambusa from Abdi, Kettle Corn from Eric and fresh baked pies and breads from the Gabe and Lori at the Julian Bakery. We'll even have a Tupperware booth so you can reduce and re-use your food packaging. Joe Hutchinson is scheduled as our live music guest. For all you lilac fans...lilacs season is around the corner! We grow lilacs on 60 year old bushes that we cut fresh every day in season from our farm. The lilacs are dry-farmed with no chemical pesticides or fertilizers--the same ones sold at this building for decades. To recieve lilac bloom time updates, join our blog or send us an e-mail at albert@wynolafarms.com. Whatever you do this weekend, we hope you'll include a visit to Wynola Farms Marketplace!